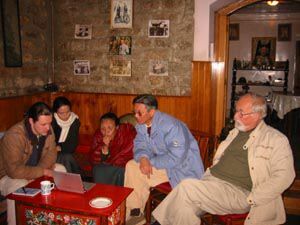 In January, 2003, Mark Turin and Sara Shneiderman travelled to Gangtok, Sikkim, India, in order to return digital copies of historic photos and 16mm films taken by Frederick Williamson in Sikkim, Bhutan and Tibet in the early 1930s. Digitised photos were returned on CD-ROM while the moving films have been stored on DVD media. 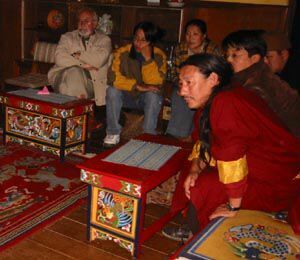 Copies of both were left with the Namgyal Institute of Tibetology (NIT) and with a number of interested individuals active in the preservation of local culture and history. Below follow a sequence of photos of the presentations made by Mark Turin in Gangok. 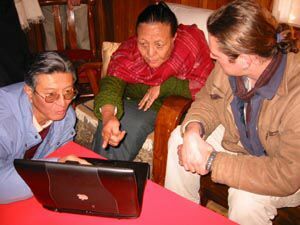 From right to left: Professor Asen Balikci (visual anthropologist), Khendzong Yapla (Secretary to the Government of Sikkim and local cultural historian), his mother, Dr. Anna Balikci (Namgyal Institute of Tibetology) and Mark Turin (Digital Himalaya) in Gangtok, January, 2003. 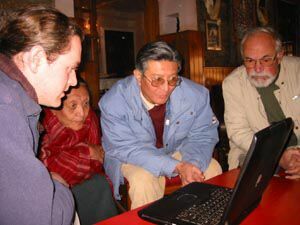 Viewing the Williamson films on DVD. 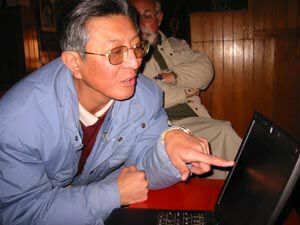 Viewing the digitised copies of Williamson photos on an Apple Mac PowerBook G3. Mother and son recognise a number of family relatives. 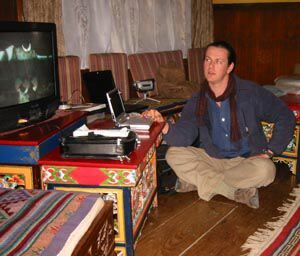 Mark Turin presenting the Digital Himalaya Project to members of the local Bhutia community in Netuk House, January, 2003. 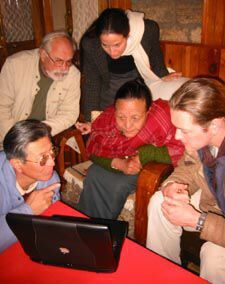 A small group of interested local Bhutia men and women watching Williamson's little-known films of Sikkim in the early 1930s. All photos taken by Sara Shneiderman © 2003.